This year, each issue of the magazine will examine a facet of the challenges and possibilities of design education in 2015. 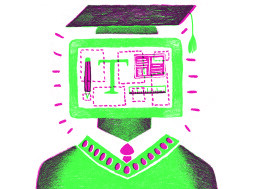 This introduction to online education is from our Feb/March issue. I am a design educator who has recently left the carpeted corridors and communal desks behind. I now occupy a teaching space in an online environment, a virtual space belonging to a different generation of learner. It has been a wholly transformative move. Within design education, ‘the studio’ is the centrepiece of teaching and learning. It has been this way since 1919 – when the idea of students practising under a master was borne out of the Bauhaus, with a clear mission to unite art and industry. Studio learning traditionally exposed students to all aspects involved in the design process: brainstorming, conversation, collaboration, experimentation and implementation. It is a social environment that fosters excellence. But it’s 2014 – close to 100 years and half a world away from the circumstances that built the Bauhaus. The current university studio experience has increased student enrolments, reduced contact hours and less dedicated studio space. In response, dexterous students on campus utilise Twitter, Behance, Tumblr, Facebook, Instagram and Dribbble, creating supportive creative online communities wherever they go. They use blogs and free online learning tools to learn software and test their design work. And they have been doing this for more than 10 years. The move forced me to re-evaluate design education, and led me to think: instead of using a century-old blueprint, should we not be working towards creating curriculum that rightly acknowledges tradition, but also mirrors the technological and innovative changes at work in the industry, and in society? Recently, my online students were asked to develop concepts for a project. Four weeks in, I watch as they regularly upload their ideas and share critique in discussion threads. The level of interest, I notice, is reminiscent of the kind of engagement found in the physical studio 20 years ago. The online design educator facilitates critiques throughout the week so that students can develop their work iteratively. This process is one of experimentation, critique and reflection, but, due to its intangibility, encouraging them to articulate process while critiquing peers is usually challenging. In this virtual environment, however, they are confident and comfortable to share and voice opinion. It is early days for online design education, but we are at a critical point. A shift is emerging and, to stay relevant, design educators need to demonstrate the same agile qualities they expect from their students. This generation has paved the way in their use of technologies to augment their practice. By acting now, educators can harness new ways of working so design traditions maintain their relevance within these contemporary and future contexts.